If the weather doesn’t quite feel like autumn (as I write this, we’ve been going back and forth), October’s programs on the Trails of History certainly point to the change of seasons. Most sites will be closed on Oct. 10 in observance of Columbus Day, but Ephrata Cloister, Fort Pitt, and the Railroad Museum will be open. Oct. 30, Halloween Eve—check the website closer to the date for details. Oct. 8, Fall Tea—enjoy tea and treats in the Stone Room of the Visitor Center. Make reservations by Oct. 7, 724/527-5584 x102. Oct. 22, Haunted History Hayride—take a wagon ride through historical scenes from Pontiac’s War. 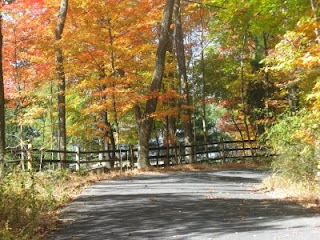 Reservations are required and will be accepted only after Oct. 1; call the site at 724/527-5584 x102. Oct. 23, Fall Park Walk and Tours-reenactors will be on hand to talk about life for colonists and Native Americans in 18th-century Berks County. Oct. 11, The Art of Blacksmithing—Fred Eberly will present this latest offering of the Friends Lecture Series. Eberly has practiced and taught blacksmithing for more than 30 years, participating in craft programs at many historic sites, including Ephrata Cloister and Landis Valley. Lecture is free and will be held in the Freeman Hall auditorium at Cornwall Manor retirement community. Oct. 16, Heritage Day—experience 18th-century life with hands-on activities and demonstrations, learn about traveling in the 1700s, and take a horse-drawn wagon ride around the Homestead. Oct. 30, Halloween at the Homestead—storytelling, face-painting, 18th-century toys and games, and trick-or-treating are all on tap for the day (admission fee varies according to activity). Oct. 9, Sunday Family Fun—learn some traditional recipes from the oil boom era; reservations and fee required, 814/827-2797. Oct. 29, Saturday Family Fun—turn plastic bags, old clothes, and hats into an old-fashioned scarecrow for your family’s garden; reservations and fee required, 814/827-2797. Oil Valley Blacksmiths will also be on site for their monthly demonstrations (blacksmith demo included in regular admission). 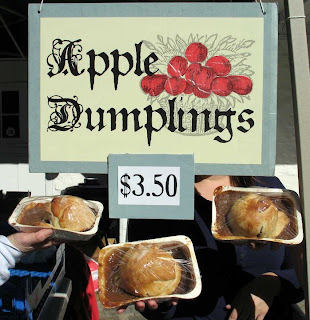 Oct. 7-8, Apple Dumpling Sales and Day of Music—a traditional Pennsylvania German treat of apples, cinnamon, and flaky pastry supports the Back to the Cloister Fund (which helps return original artifacts to the site); on Saturday only, the Ephrata Cloister Chorus will perform at 2, 3, and 4 pm. Admission fee required if you’d like to attend the choral performance (and tour the site), but not if you’re just there for the food. Oct. 9, Behind the Scenes Tour—visitors will have an opportunity to tour the rarely seen upper floors of the Sisters’ House. Reservations are strongly recommended; a fee of $10 is required for this special program. Physical accessibility on the tour is very limited due to steep and winding stairs. Oct. 14-15, Mysterious, Melancholy, and Macabre—stories of early Lancaster County, ripped from the headlines of local newspapers, presented in a dramatic storytelling format; reservations suggested, 717/733-6600. Oct. 21, Community Days—students of all backgrounds and grade levels visit learning stations at their own pace to learn about the thriving community of Ephrata in the 18th century; reservations strongly encouraged, 717/733-6600. Oct. 15, Speaker Series, “The Dynamic Dozen – 13 Lake Erie Shipwrecks”— divers Georgann and Mike Wachter will share images and stories of wrecks in the fresh waters of Lake Erie. Oct. 15-16, 22-23, 29-30, Ghosts Afloat—Niagara will be the setting for local lore (drawn from the ship’s history) in this new program offered in partnership with Mercyhurst College. Tickets must be purchased in advance (online or at the museum store). Oct. 2, RAD Day—enjoy free admission in honor of Pittsburgh’s Regional Asset District. Oct. 15, Wild Resource Festival in Point State Park—costumed reenactors from the Museum will be set up in the park to interpret 18th-century hunting, fishing, and construction practices. Oct. 1-2, World War II Weekend (rescheduled from late Sept.)-period reenactors and equipment will be on site, encamped for the weekend; enjoy the West Chester Swing Kings concert Saturday evening. Admission charged, no fee for WWII veterans. Oct. 8, Dog Faire—a chance to meet and greet, visit vendors, and learn about area rescue organizations. Oct. 21 and 28, Moonlight Tours—Living History Theater presentation explores the history of the Keiths, Graemes, and Fergussons and relates various ghostly stories; reservations required, 215/343-0965. Oct. 1, Whitemarsh Township History Tour—Hope Lodge is a featured stop on the tour; choose a bus tour or a self-guided driving tour, then contact the township for info and to reserve your spot, 610/828-7276. Oct. 8-9, Harvest Days Festival—traditional Pennsylvania German harvest activities and more than 80 demonstrators bring the village and farms to life; at the Pumpkin Patch you can choose your own orange gourd, decorate and carve it, and take it home. Oct. 29, Bus Trip to Winterthur Museum—a full day of exhibits, tours and curator presentations; reservations are required by Oct. 19, contact Cindy Reedy at 717/581-0591 or c-creedy@pa.gov. Oct. 8, Oktoberfest—Penn Pilsner beer, German food, and lively music on a fall evening; reservations required, 724/266-4500 x101. Oct. 15, Historic Trades Workshop-Five classes to choose from: blacksmithing, broom making, penny rugs, tinsmithing, and wreath design. Registration required by Oct. 3, call 724/266-4500 x101. 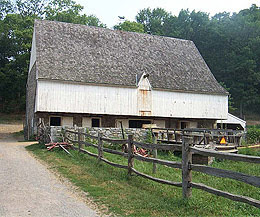 Oct. 2, Historic Trades—the joyner and blacksmith will be plying their trades (wood- and metalworking, respectively). Oct. 9, Living History Theater—“The Sotcher Wedding” celebrates the traditional Quaker ceremony uniting John Sotcher, Penn’s steward, and Mary Lofty, head housekeeper. Who doesn’t love a wedding? 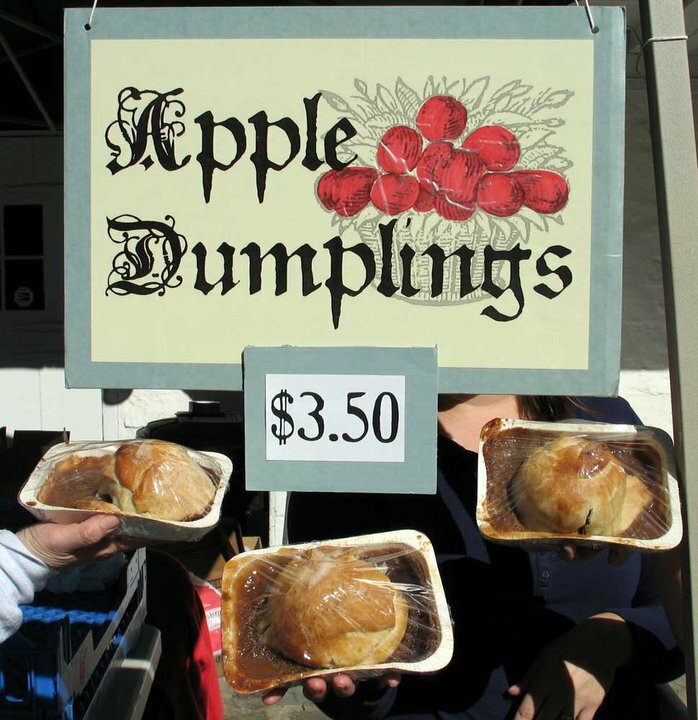 Oct. 16, Open Hearth Cooking—Pennsbury cooks will recreate a 17th-century baking day, with the aroma of bread (and other good things) filling the air. Oct. 23, Cider Making—in the fall, colonial households would press apples and put the cider up to ferment (makes winter so much nicer). You can sample the unfermented product as part of the program. Oct. 30, Living History Theater—“Witch Trial” presents the 1684 case of Margaret Mattson, accused by her neighbors of witchcraft; William Penn presided over the trial. You get to be the jury and hear the evidence—is she guilty or not? There will also be family-friendly trick or treat activities during the afternoon. Oct. 8-9, Heritage Days Antique and Collectibles Show—food, door prizes, plenty of parking, and loads of antiques and collectibles; consignment items are welcome, contact Pete Folk, 814/435-8216. Oct. 4, Central PA Civil War Roundtable Lecture—“Fort Sumter: First Blood in South Carolina,” with speaker Joe Mieczkowski (a Gettysburg Licensed Battlefield Guide), explores the beginning of the Civil War 150 years ago. Oct. 22, Natives in Pennsylvania—visit the website closer to the date for details. Oct. 2, Indian Day at Fort Hunter—the State Museum archaeologists will be at Fort Hunter (north of Harrisburg) talking about recent excavations and evidence of native American activity on and near the site. Oct. 12, National Fossil Day—visit the website closer to the date for details. Oct. 21, 3rd in the Burg—the museum participates in downtown Harrisburg’s monthly party, this month sponsored by Harrisburg Young Professionals. Oct. 22, Great Pumpkin Day—a wonderful way for families to prepare for Halloween, with crafts, activities, and food. Oct. 15, Harvest Day-living historians will demonstrate blacksmithing, period cooking, and handwriting; there will be a military encampment, and the historic buildings will be open for tours. September has been pretty eventful, what with the 10th anniversary of the September 11 attacks, plus Tropical Storm Lee (while the aftermath of Hurricane Irene was still fresh), record flooding, power outages, etc. The Trails of History were affected by all of those to one degree or another. None of our sites suffered catastrophic damage, as far as I know, but many will be cleaning up and drying out for some time to come (as, I’m sure, will many of you). As September draws to a close, though, I thought I’d show you a few of the less dramatic (though no less interesting) events that took place. Last weekend’s Family Fun Day at the Scranton Iron Furnaces got some nice local coverage. The goal of the program was to bring more visibility to the site (which is open on a fairly limited schedule due to staffing) and invite local kids to learn something about the history of their city. Tour guide Dominick Azzarelli was quoted in the Times Tribune article: “The furnaces are the reason why Scranton is Scranton today.” The site also worked with other community groups, who were on hand to help with local history and fire safety information for families who stopped by (which explains the guy in the photo above, between director Chester Kulesa and board president Bob Savakinus). Washington Crossing Historic Park was featured in an article on Phillyburbs.com last week on the top 10 ways to enjoy fall foliage in Bucks County. The article suggested a stroll through the park to learn the history and a visit to Bowman’s Hill Tower for a birds-eye view of the county’s beauty. Another article on Phillyburbs.com profiled the site’s new curator, Kimberly McCarty, who previously was curator at Pennsbury Manor (welcome back, Kim!). Those of you following the schedule for the Civil War Road Show know that its appearance at the Bloomsburg Fair (like the Fair itself) was cancelled due to severe flood damage. Two new venues have been added to finish out the season. The traveling exhibit will spend this weekend (Sept. 24-25) at Linvilla Orchards in Media (Delaware County) and next weekend (Sept. 30-Oct. 2) at Peddler’s Village in Lahaska (Bucks County). Visit the Road Show website for details. This week’s guest blogger is Lee Price, Director of Development at the Conservation Center for Art and Historic Artifacts (CCAHA) in Philadelphia. CCAHA, in partnership with PHMC, the PA Federation of Museums and Historical Organizations, and LYRASIS, is leading a statewide effort to preserve the millions of objects and historic artifacts that shape the Commonwealth of Pennsylvania’s history and define our nation. Save Pennsylvania’s Past, a two-year initiative to improve collections care throughout the Commonwealth of Pennsylvania, celebrates the state’s great historic collections. 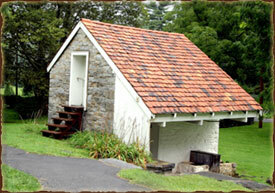 Save Pennsylvania’s Past calls upon the state’s leaders, both public and private, to support the work of preservation. It will streamline information regarding available resources. And, most importantly, Save Pennsylvania’s Past will offer training for staff and volunteers, with registration starting now. Three traveling educational programs are being offered in 2011-2012. For each of these programs, full-day sessions will be offered at locations in Erie, Pittsburgh, Johnstown, Boalsburg/State College (at the Pennsylvania Military Museum), Allentown, Scranton, Philadelphia, and York. Archivists, collections managers, librarians, curators, and other staff members involved in collections care must manage a variety of tasks, including implementation of collections management plans and policies, management of environmental controls and storage conditions, and provision for safe use and exhibition of collections. This program will provide participants with an overview of the preservation standards for the many aspects of collections care. 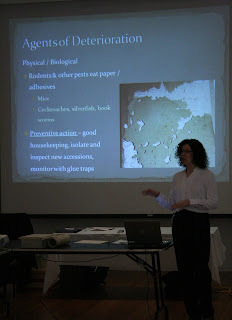 Speaker: Laura Hortz Stanton, Director of Preservation Services, Conservation Center for Art and Historic Artifacts. 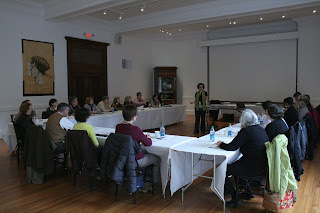 Workshops are scheduled between Oct. 6, 2011, and Jan. 13, 2012; the details are here. Every institution struggles with pressure to be visible on the web and to make its collections accessible to wider audiences, and many face daunting hurdles to implementing digitization programs. This program will cover basic issues in digital preservation, including an introduction to digitization, and will provide information on handling guidelines for digitization, selection of materials, conducting pilot projects, creating access to digitized materials, funding sources, and the benefits of collaborating with other institutions. Speaker: Thomas F.R. Clareson, Senior Consultant, Digital & Preservation Services, LYRASIS. Workshops are scheduled between Feb. 21 and Apr. 25, 2012; the details are here. Proper archival procedures enable safe and effective management of collections. Participants will learn about the fundamentals of archival appraisal, acquisition, and access; proper storage materials; and the most common preservation problems associated with paper-based archival collections. This program will touch briefly on processing, arrangement, and description. Volunteers, historians, and those with archival responsibilities in addition to other duties may find themselves in the position of "archivist" without formal training in the profession; this program offers an introduction to best practices in the field. Speakers: Beth Bensman, Certified Archivist, and Dyani Feige, Preservation Specialist, Conservation Center for Art and Historic Artifacts. Workshops are scheduled between May 9 and July 16, 2012; details are here. Additional information and registration materials for all three workshops are available at CCAHA’s website. 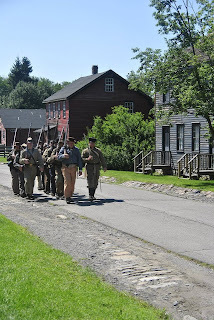 During this first summer of the 150th anniversary commemoration of the American Civil War, the Trails of History have been buzzing with activity. And speaking of buzzing—you can now buy coffee, along with other CW150 merchandise, at ShopPAHeritage.com (clearly, my product placement strategy for Trailheads isn’t very sophisticated, yet). Anyway, the end of summer (metaphorically, if not officially) seems like a good time to reflect on recent activities. The Civil War Road Show’s stop at Somerset Historical Center August 26-28 was a big success. Some 2,400 people visited the grounds of the Historical Center over the course of 3 days that included an encampment, a lecture, door prize drawings, and a members-only opening. People waited in line to tour the Road Show exhibit, once again proving that history is not dead. There are lots of photos on the Historical Center’s Facebook page, and The (Somerset) Daily American also posted photos. The video is from the Tribune-Democrat in nearby Johnstown. 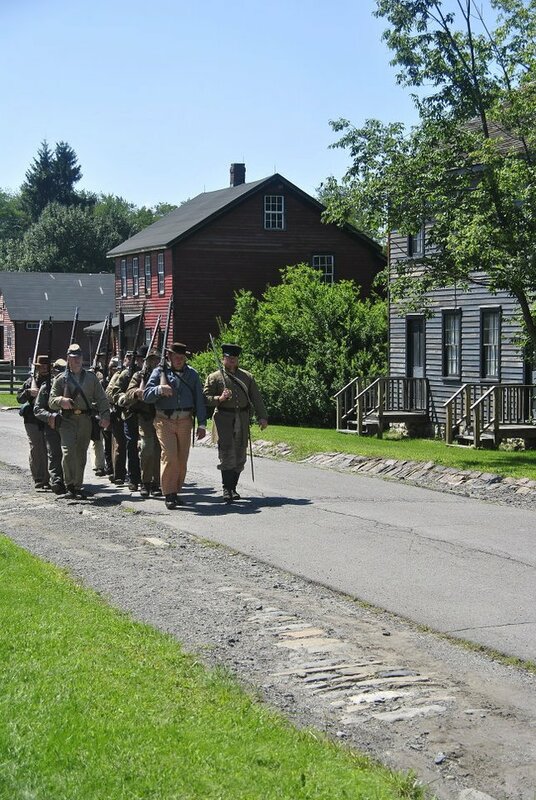 The previous weekend (Aug. 20-21) Eckley Miners’ Village offered a living history program that brought the Civil War to a coal patch town. In addition to Union and Confederate reenactors encamped and offering demonstrations of military drills, Eckley’s living history troupe staged a funeral for a Union soldier killed in the war (as well as a wedding to lighten things up). 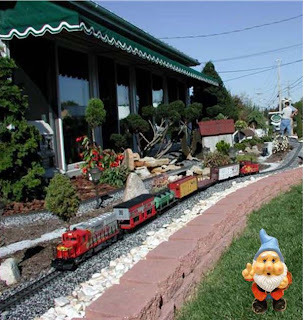 Read an article from The (Wilkes-Barre) Times Leader here and find some wonderful photos on Eckley’s FB page. Editor's note, Sept. 15: Last week's flooding has affected some programming--the Gallery Walk activities at the State Museum (listed below for Sept. 11) are now happening Sept. 18; the Bloomsburg Fair (the last week of the month) has been cancelled, which I assume means the Civil War Road Show won't be visiting the area either (I'll post updated info as I get it). Please check ahead with sites to make sure the event you want to attend is still going on. Most sites on the Trails of History are open Sept. 5 for Labor Day, so please consider spending some of your holiday with us. But if you can't, the rest of the month has some great stuff. Sept. 23-24, Hunter-Trapper Education—check website for more info. Sept. 25, Under the Lackawanna Moon—a theatrical presentation using monologue, dialogue, and music to tell stories of settlers and early residents of the Anthracite region; reservations requested, call 570/963-4804. Sept. 11, Commemoration Ceremony—remembering the Battle of Brandywine, Sept. 11, 1777, and the events of Sept. 11, 2001. Sept. 10, Lecture—Dr. John Boback, director of education at Meadowcroft Rockshelter & Historic Village, will talk about the lifestyle and subsistence strategies of prehistoric American Indians (free to members of Bushy Run Battlefield Heritage Society). 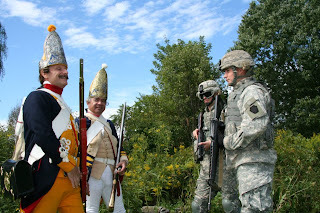 Sept. 2-4, Crawford County Fairgrounds, Meadville—hosted by Crawford County Civil War Roundtable. 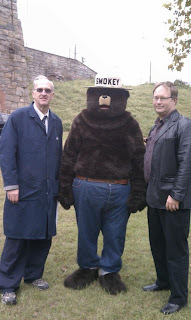 Sept. 9-11, Grant St. between Sutton-Ditz Museum and Memorial Park, Clarion—hosted by Clarion County Historical Society. Sept. 17-19, Ephrata Public Library, Ephrata (Lancaster County)—hosted by Ephrata Public Library in partnership with PA Dutch Convention & Visitors Bureau and Historical Society of the Cocalico Valley. Sept. 24-Oct. 1, Bloomsburg Fair, Bloomsburg (Columbia County)—hosted by Columbia-Montour Visitors Bureau and Bloomsburg Fair Assn. Sept. 11, Interpretive Sunday—learn about women’s work on the 18th-century frontier, and ask questions about Native American life; program is free to the public. Sept. 13, Lecture—Jim Schucker will present a talk on the Union Canal Tunnel; check the website or contact the site for more details (lectures are held in Freeman Hall at Cornwall Manor). Sept. 17, Cast Iron Cooking Demonstration—contact the site for more info. Sept. 11, Band on the Run 5k Run & 1-Mile Fun Walk—held in conjunction with Daniel Boone High School Music Boosters (go here for details). Sept. 18, Nature Program—check website for details. Sept. 11, Sunday Family Fun—“Uncovering the Past” will allow families to learn about the work of archaeologists through a mock excavation; limit 10 people, fee charged (call 814/827-2797 for reservations). Sept. 17, Fall Gas Up—enjoy antique engines on the grounds of the museum; admission charged. Sept.24, Saturday Family Fun—“Oil Spill Clean-up” looks at how to handle a spill (you can earn your Boy or Girl Scout badge through this program); there will be 2 sessions, limit 10 people per session, fee charged (call 814/827-2797 for reservations). Also on Sept. 24, Oil Valley Blacksmiths will be on-site for their monthly demonstration day. Sept. 11, The Story of Big Mary—presented by Regina R. Dasher, this program explores the aftermath of the Lattimer Massacre and the labor movement that resulted. 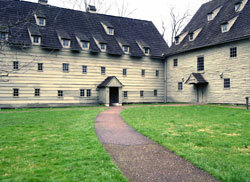 Sept. 10, Founders’ Day—the historic site celebrates the birth of the modern borough of Ephrata with $1.00 general admission and activities highlighting Ephrata’s first residents (special tours of the upper levels of the Sisters’ House will be available for $10.00--$8.00 for members of Ephrata Cloister Associates and PA Heritage Society). Sept. 24, Speaker Series-Bayfront historian Jerry Skrypzak's talk will explore Erie's docks and commercial fishing industry. Skrypzak's presentation is based on extensive research and photography of Erie's waterfront with David Frew; the two have co-authored a book, Fortune and Fury, A History of Commercial Fishing in Erie, which is available in the museum store. The talk is free and open to the public. Sept. 21, Homeschool Day—homeschool families are invited for a day of educational activities. 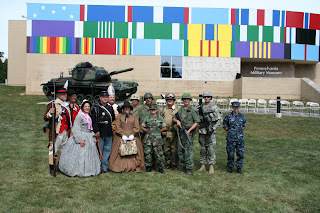 Sept. 24-25, World War II Weekend—encampment of WWII-era reenactors, demonstrations, and a swing concert in the evening. Sept. 4, 11, 18, 25, Ice Cream Sundays-Enjoy ice cream sundaes (make your own for $1) and music by the Lancaster County Folk Music & Fiddlers Society (and watch for a "live" report from me, I hope, later this month). Sept. 22, Hands on History Day—an opportunity for children of all ages to experience history up close and personal through activities and demonstrations. Sept. 10, Wine Tasting Party—visit the wine cellar at Old Economy and taste wines from around the world; call 724/266-4500 x101 for reservations. Sept. 24-25, Erntefest Harvest Festival—see how the Harmonists celebrated the harvest and prepared for winter; enjoy site tours, Harmonist music, and lots of family-friendly activities. Sept. 4, Historic Trades—the blacksmith and joyner will be on hand for their monthly demonstration of metalworking and woodworking skills. Sept. 11, Living History Theater—“The Departure” brings community members (and visitors) to Pennsbury to bid farewell to the Penn family as they prepare to return to England in 1701. Sept. 26, Garden Highlights—visit the fall garden and experience its colors and textures. Sept. 6, Lecture (and picnic)—“Not Frail Flowers: Six Pennsylvania Women Who Made a Difference in the Civil War,” with speaker Linda Estupnian Snook. 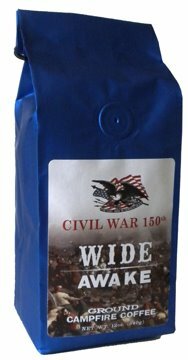 Presented by Central PA Civil War Roundtable; attendees are encouraged to bring a potluck dish to share. Sept. 17-18, Then & NOW—this popular living history timeline program brings together military equipment, uniforms and reenactors from the colonial period through the present. Sept. 28, Friends of PMM Speaker Series—“Vikings: the Evolution of Attack,” with Prof. Ben Hudson, Penn State University, whose talk will trace the progression of Viking military actions culminating in the important Battle of Clontarf, fought in Ireland in 1014 against the legendary Irish high king Brian Boru. Sept. 24, Members Day—lectures, book-signings, and films are among the day’s activities, open to members and guests of Friends of the Railroad Museum (it’s never too late to join). Sept. 17, Family Day—check website for details. Sept. 9-11, Mountain Craft Days—visit the 42nd Annual folk festival with over 125 craft artisans and demonstrators; great local food (trust me on this) and activities for kids. Sept. 11, Gallery Walk Activities—last day for Art of the State exhibit and IdeaZone: Experience the Arts; Artist Conversation with Best of Show winner Lydia Panas and awards juror Ricardo Viera; reception for Doshi Gallery exhibit opening; Susquehanna Art Museum’s VanGO! Sept. 18, Grand opening for new museum store—as part of Harrisburg’s 3rd in the Burg monthly celebration, see the new store and enjoy a “Mad Men” themed reception. Sept. 28, HomeSchool Day—gallery talks and demonstrations highlight the museum’s varied collections and programs. Sept. 18, Open Hearth Cooking Class-food historian Connie Unangst will teach how to stew, boil, roast, and bake using 18th-century techniques and recipes. Space is limited and you must be at least 12 years old to participate; registration and fee required, call 267/475-2353.